In this case, I used some flower potting soil I had handy – which is usually a no-no! The usual flower soil you get in the store has added fertilizers, which can harm sensitive cannabis seedlings. The trick is to wash the soil before using it for seedlings. Simply place a gallon of the soil in a large flower pot, colander, or bucket with holes punched in the bottom, and slowly water it with a gallon of water. Start slowly to make sure the soil becomes damp – if you just dump in a full gallon, the soil may float and the water run out below without removing excess fertilizer. Note: If you prefer not to waste the fertilizer that was in the soil, I suggest catching the runoff, further diluting it, and making a nutrient-rich fertilizer tea according to the tips in our grow book. This way, none of the fertilizer is wasted, and the tea will be ready for the first stages of fertilizing your plants in the vegetative phase (tips on this also in our grow book). Spread out the rinsed soil on newspaper to dry; it will be too wet for immediate use for seedlings. This may seem like a messy project and a lot of extra work, but unless you a have a proper soil for marijuana seedlings, you may be sparing yourself the bitter disappointment of nutrient-burned (and even dead) seedling plants. See the pictures here of an over-fertilized Auto Pineapple Express plant. This poor plant never reached it’s full potential – stunted in her youth by the fertilizers in potting soil! As you may have noticed in the previous post, I started many of the seeds together in one small pot, and have now transferred them to their own individual small pots. Why do the extra transplanting? To make lighting easier! I incubate the seeds using a single bulb – my own energy-efficiency obsession, perhaps, but very effective, and space-efficient as well. Once I can see if all the seeds are sprouted and looking healthy, I transfer them to their own small pots for the next week or so. 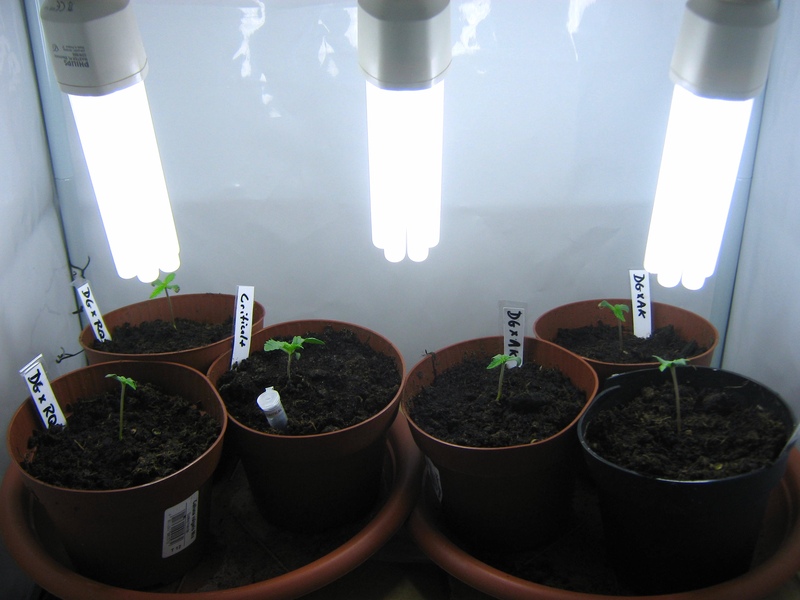 These small pots allow me to place the seedlings close together, and therefore keep the lighting close to the plants. If they were already in larger pots, the light intensity would suffer as the bulbs are spread out to accommodate the larger grow area – the higher the light intensity, the faster and healthier they will grow! This is especially important for a low-wattage grow such as this. One last tip for this time – When to move the seedlings to larger pots? As a rule of thumb, root systems generally mimic the size of the above-soil vegetation. So when the seedlings are nearing the height and width of the pot they are in, it’s time to move them. If you wait too long, the roots will start to crowd, and there will be a longer lag time for them to continue vigorous growth in the new soil. Transplanting also gives me a chance to have a peek at the roots. In some cases, the young plants will develop unusual leaves, discoloration, etc. If I notice that the roots look weak as well, it’s an opportune time to ditch the plant and concentrate on the healthiest specimens. Out of these six seedlings shown above, I expect to keep four (perhaps five), of which two or three may be males. If I have two or three strong plants to take into flowering, that will fit the 100 watt grow perfectly. Unless seed cost is a major factor for you, I suggest trying the same approach; sprout more plants than you can house at full size, and “weed” out a few along the way – your final yield and quality will be much better than if you set all your hopes on just one or two plants and wind up with a less than stellar specimen to finish your grow. I have never had an issue with using Miracle Gro blue bag soil for starting seedlings, though I typically only use it at about half strength or less, mixing it in with previously used soil, which has healthy quantities of mycorrhizae and beneficial nematodes. It is cheap soil and I never have to fertilize in veg. It also doesn’t mess up the taste because the fertilizer gets used up by the time flowering is initiated, so the nutrition in flower is controllable.